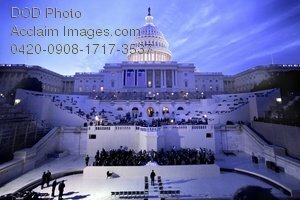 Description: Free, public domain image: Capitol Hill and Grounds at the Capitol Building During the Presidential Inauguration. U.S. service members prepare for the 56th Presidential Inauguration rehearsal in Washington, D.C., Jan. 11, 2009. More than 5,000 men and women in uniform are providing military ceremonial support to the presidential inauguration, a tradition dating back to George Washington's 1789 inauguration. (DoD photo by Master Sgt. Cecilio Ricardo, U.S. Air Force.